Anyone at all familiar with me will know that I’m a big fan of Little Busters! I first played a fan-translated version of the original some two years ago, and it even became the subject of the very first game review I wrote for oprainfall. I loved it at the time, but it was one of the first visual novels I ever read in its entirety, so the long-awaited release of Little Busters! English Edition gave me a great chance to take another look at my favorite visual novel of all time. Let’s take a look and see if my love for this game holds up now that I have more experience. Little Busters! follows a narcoleptic second-year high school student named Riki Naoe. He attends school with his childhood friends Kyousuke and Rin Natsume, Masato Inohara, and Kengo Miyazawa, known collectively as the Little Busters. Following Kyousuke’s decision to form a baseball team, the group is eventually joined by the happy-go-lucky Komari Kamikita, the troublemaking Haruka Saigusa, the mischievous and mature Yuiko Kurugaya, the tiny foreign student Noumi Kudryavka, known as Kud, and the quiet, reserved Mio Nishizono. Joining them are the extra routes initially added in Little Busters! Ecstasy: the haughty Sasami Sasasegawa, the rigid prefect Kanata Futaki, and Saya Tokido, an original character added in Ecstasy. I never knew Saya was this adorable. 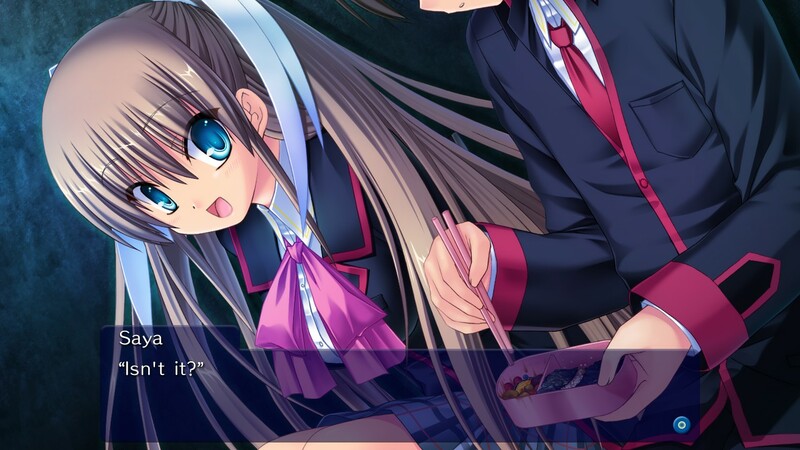 As is the norm for Key’s visual novels, Little Busters! is a romance nakige (“crying game”) which follows Riki as he sorts out each girl’s problems in their routes, unlocking the final route, titled Refrain, after finishing each route once. Finishing Refrain then unlocks the Sasami, Kanata and Saya routes. English Edition also comes with a host of new features, namely stemming from its use of Key and Prototype’s new LUCA Engine. It allows for actively switching between English and Japanese text with a press of a button, rewinding text as well as being able to skip backwards with the backlog, support for touchscreen devices and mouse gestures, and the new Busterpedia, similar to the Dangopedia or Tomopedia in CLANNAD’s English release and Tomoyo After ~It’s a Wonderful Life~ English Edition. The graphics are 1280 x 720 for the first time in a PC version, and event CGs can be scrolled and zoomed out to see the whole image when the text box is hidden. Little Busters! is a bit more gameplay-heavy than some visual novels. This mainly comes in the batting practice minigame, where the player controls Riki in the batter’s box to hit balls pitched by Rin. 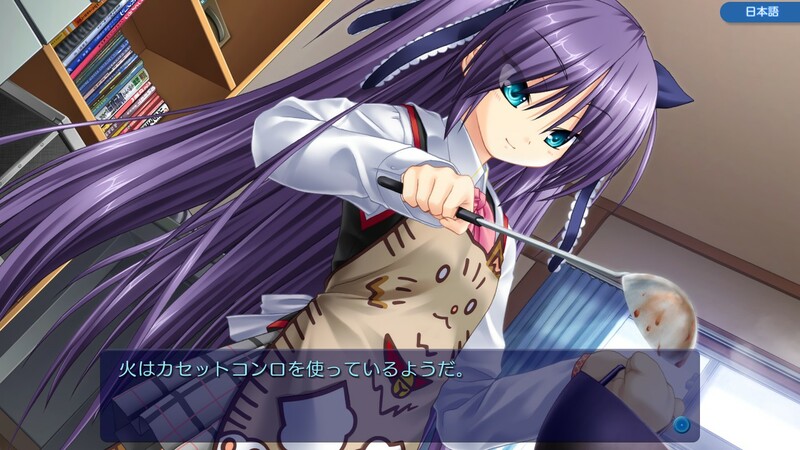 You can have interactions with the other Little Busters members by hitting the ball to them or one of the many cats around the field, which helps raise their stats for the battle rankings, the other main minigame. At certain points in the common route, you have the chance to wander around and fight a random other member of the team in random combat, with the chance to take their spot and rise to the top of the rankings. However, Saya’s route also adds a new element: a light first-person dungeon crawler, with occasional shooting gallery parts as well. This gameplay, which constitutes the bulk of her route, focuses mainly on solving small puzzles on each floor to progress and occasional combat. Any of these minigames can be disabled to make progress quicker, or if you just want to focus on the story, although disabling combat in Saya’s route does not remove the exploration. Sometimes all someone needs is a baseball to the face. The game, including each of the minigames, is fully controllable with mouse button presses and gestures without the need for the keyboard, as well as touchscreen controls, although touch does not readily allow for active language switching. In batting practice Riki can be controlled by clicking and dragging with the mouse or touch, releasing to swing. This control scheme is incredibly easy to use, although it does make hitting balls angled up or down somewhat trickier than with the keyboard. Saya’s shooting game benefits greatly from the touchscreen for those with access to one, removing the necessity of aiming with the mouse and instead just tapping on targets to shoot. The overall streamlining of controls was unnecessary but nice to see as a form of modernization, although it may have been interesting to have controller support as well. The one thing I wasn’t a huge fan of was the simplification of the HUD; the buttons in earlier games are gone, with the HUD consisting only of the text box and date indicator while everything is controlled with button presses and gestures. In my opinion, the removal of the buttons was wholly unnecessary, and there’s nothing stopping them from making the functions usable with both gestures and HUD buttons. The minigames themselves are still enjoyable, although the first iteration of Saya’s shooting game, before her route restarts, is somewhat frustrating. The story is just as fantastic as it’s ever been. There’s definitely value in playing through it a second time; it gives you the chance to notice things you may not have the first time after you know the main secret behind the overarching story. There are points of foreshadowing that I could never have noticed the first time, as well as helping understand the true meaning behind each route. While it did help me better understand each route, Mio’s still stands out as the weakest, even after adding the new routes into the mix. As for those new routes, it was refreshing to see things I’d really never seen before, and seeing Sasami and Kanata more fleshed out than they could have been in the original. Kanata’s route was particularly interesting; she was my least favorite of the characters in the original, and while her route may not necessarily have made her likable for me, it at least made her sympathetic and tragic. I may still not like her, but at least I feel like I understand her better now. Sasami, in particular, grew on me over the course of her route, and with Saya, it was interesting to see someone I was wholly unfamiliar with, along with an entirely new route structure for her. Previously-read text is marked in blue, and the language switching could theoretically help you learn Japanese grammar.